Self Hosting. This time I would like to share my experiences for the bloggers about the advantages in use the self-hosting wordpress in SEO as far as I'm concerned. My first blog was using blogger, started in 2011 until now. The assortment of internet servers and hosting providers I had tried. Dozens of my domains had been registered on the internet. I Already I faced many times the hacker attacks, hackers either domestic or foreign hackers. But now I am more active in blogger. The main reason is that most bloggers easier to manage, according to me. Now I want to re-review the advantages in terms of seo wordpress blog and a few other things. What are the advantages of self-hosting wordpress blog in SEO? 1. WordPress has a strong position in the search engines. Not easily eliminated by other blogs and easy to appear on the first page of google. 2. Wordpress more easily indexed by various search engines quickly without having to submit to various search engines. 3. Wordpress does not need optimization, you simply concentrate to write articles is enough to go up to the first page of google. (I) Well, now there is one more privilege of wordpress. You can create a new subdomain to get rank high straight. Not start from zero. For example: your main domain has a high rank, and you intend to create a new subdomain. So the new subdomain immediately have a high ranking on the spot, to match your main domain. Pagerank and Alexa rank will join the main domain, subdomain ranked so you do not start from zero again although it was only one hour. (Ii) There is another privilege wordpress. You will be trusted by the client. Of course, the self-hosting wordpress blog will looks professional. (Iii) There's more other advantages of wordpress. Are you an adsense publisher? Try to use wordpress so that you know the difference of its earnings. You can increase adsense CTR easily because it is supported by various sophisticated wordpress plugin. (-) however wordpress has the disadvantage to. 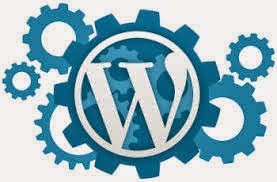 Disadvantages of wordpress is the management more difficult when compared to the blogger. I have quite confused manage my wordpress. While bloggers easier to manage because we can easily understand it contents. Additionally, bloggers have a lot of support and complete features, for example, the template style more options available than wordpress. (!) My recommendation. You do not leave blogger even though you have a wordpress. Because bloggers easier to make friends. Blogger equipped and supported by a wide range of features and applications braid friends. Therefore, if you have both, then your blogging activity will be more perfect. (?) But there are also drawbacks if you too have a lot of blogs. The effect is that you will be difficult to take care of all your own blogs!